It’s a rare triple header around Mexico City today. The Crash, AAA and CMLL all have events in the city (or right outside of it), something that hasn’t happened before with those three promotions. Even more unlikely, two of those shows will actually be streamed live. AAA’s Guerra de Titanes is the biggest of those shows. They’re at their usual Mexico City home of Gimnasio Juan de la Barrera with five title matches, and most of them even make sense. The biggest is the Wagner/Mundo heavyweight title match. We’ve been kind of expecting Mundo to drop the title and finish with AAA every time he appears, and Mundo keeps the title and comes back months later every time. It’s gone on so long that the expectations have changed, and Mundo being advertised for shows way in February suggests this won’t be the end of him either way. The real drama is with Vampiro as referee: does he get set up as Mundo’s next opponent, or is this Vampiro going rudo by costing Wagner the match? Fantasma & Texano meet in a cage match for the Latin American title, which might be a TripleMania preview. Psycho Clown & Rey Escorpion will be in a chain match, which might be bloody. Four teams will be in a trios title match, which probably means Aerostar and other are leaping off high places. Lady Shani & Faby Apache have a women’s title match, which might be Shani’s best match ever. (This week’s TV match was promising.) Lanzelot versus Australian Suicide for the cruiserweight title is scheduled to air on the show. If you want a much longer preview, I’ve got a piece on this show coming up on Voices of Wrestling this afternoon. EDIT: it’s up now! You can actually watch this show live. AAA’s going to stream it on their Twitch channel. tonight at 9pm CT. It looks like this is only going to be in Spanish, which is fine at this point. The show should be able to watch for about a day after the fact, and then will air on TV start in February. CMLL isn’t as loaded with big matches, though it is loaded with guys who haven’t been in Arena Mexico in a couple weeks. The main event is Atlantis, Dragon Lee, and Volador versus Los Guerreros Laguneros, where everyone beside Euforia was on FantasticaMania. I hope Atlantis looks better than he did in Japan, or they can find a way to hide him. The rest of the match looks great. Terrible versus Diamante Azul for the national heavyweight championship is the semimain. Like I mentioned last night, this hasn’t been a CMLL title for a very long time. CMLL and EMLL haven’t ever really been that in to heavyweights, so it was rarely title being defended on their major show. The last time I can find it defended on an Arena Mexico Friday night show is 1985; it’s likely more recent than that, because my records are spotty at that point. CMLL has had their own heavyweight championship for that in between time, but it also doesn’t get defend on Fridays often. The last time that heavyweight title was defended on a Friday night was January 30, 2015 – when Terrible lost the title to Maximo. Terrible might not have any better tonight. Diamante Azul is going to win a bigger title at some point, and it kind of makes sense to have a tecnico heavyweight champion given all the possible challengers are rudos. (Terrible listed off all the challengers he could think of on Informa, and pretty much all of them are guys he normally teams with.) Diamante Azul hasn’t look great in singles match. Terrible has looked pretty good, and there’s a chance they can make something work. There’s nothing else with a big deal storyline on the show, but the matches could be interesting. The Angel Brothers & Stuka take on NGD, following a slight rivalry now seen in two countries. Disutrbio, Misterioso and Virus face Audaz (first match here with new name), Starman and Drone – or at least it’s scheduled to be Drone. We’ll see. The second match has Electrico joining the main roster to team with old friend Astral & Star Jr., facing Cancerbero, Nitro & Raziel. The show opens with Flyer & Robin versus Akuma & Espanto. The first three there are pretty good, so this could be better than usual. CMLL’s show will air at 8:30pm on clarosports.com and on their Facebook page. The Crash is the most low key of the three shows, and the story there isn’t even really the matches. The Crash says they’re taking over indie venue Salon Citlali as their own training center. I don’t really have a great sense of what that means; other promotions are still listed as running the building next month, so the change may not be all the significant in what we see. Having a base of operations right outside of Mexico City might help them – the Mexico national media tends to pay more attention to things happening closer to the capital, so being there might make it easier to raise their name. Maybe they’ll explain more today. 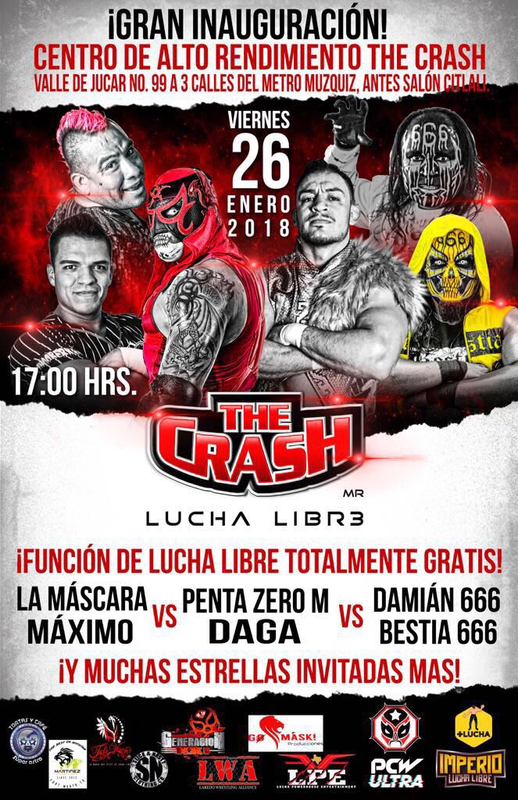 The only advertised match is a three way La Mascara & Maximo vs Penta Zero M & Daga vs Damian 666 & Bestia 666, though it sounds like there may be more bonus matches with indie wrestlers. The Crash show isn’t announced as streaming live. It’ll likely pop up in some fashion on the usual YouTube channels and I wouldn’t be surprised if someone tried Periscoping it at some point. The Crash did show some of it’s last show on their Facebook page, so perhaps check in on that sometime after 5pm. CMLL announced Kawato San will not debut on Tuesday due the immigration procedures. Instead, in the time it took me to finish writing this paragraph, they’ve announced he’ll debut on February 2nd. That’s a Friday instead of Tuesday, so it’ll be more high profile match. Alberto’s Lucha Por Ellos show did air on Claro, though the TV network and not the internet stream. I caught a little bit of it, and it seemed like they aired the top two matches (Octagon/Fuerza trios, triangle match which turned into a tag match with Alberto & Fantasma vs Cibernetico & Wagner.) I had trouble recording it and didn’t really seem like you were missing anything. It’ll reair this weekend and I may take another try at it. The Crash announced Diosa Atenea will debut on their on 02/16 show, after doing well at their recent women’s tryout. SuperLuchas has a video feature on Saru. LuchaWorld has a new episode of LuchaWorld Podcast and the Lucha Report. Lucha Talk has a new episode of their podcast.